This is part 2 in a series of blog posts to highlight the work of our Teaching & Learning Innovations team. Each team member was asked to write a post about the work of one of their colleagues. Michael McGarry describes his journey to becoming the Instructional Technology Lead at CSU Channel Islands as “weird” yet “organic”. He started his career at CSUCI as a student assistant in the web services department as a sophomore working toward a bachelor’s degree in Graphic and Web Design. Michael remembers his area of focus shifting slowly from web design to instructional support while creating instructional tutorials for faculty members and handling online class administrative duties. Being able to see the “happiness and joy” faculty get out of his work has always filled him with a sense of pride. He was eventually hired as a web designer at CSUCI after graduation, Michael’s skills and interest kept growing in his instructional support role; helping teachers put together their online classes, creating helpful guides on digital tools, and making a impact within the learning community around him was all part of the fun. With the help of his new full-time roll on the Teaching and Learning Innovations team and the mentorship of Dr. Jill Leafstedt, Michael grew into his professional identity, not just as a strong source of day-to-day technical support for online classes, but as someone who had the opportunity to positively impact the face of pedagogy on campus. According to Michael, this was the “weird” part of his career because he got to a point of influence in his learning community with no practical “hands on” teaching experience. He enjoys learning the ins and outs of the classroom from the faculty he supports, but he sought to learn more about the wider importance of the weaving of good pedagogical practices and technological engagement into his community. Moving forward with his work for the the TLI team, Michael received his Master’s Degree in Instructional Design and Technology in 2017, eventually leading to his current position as Instructional Technology Lead. 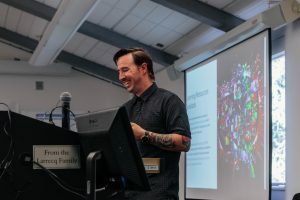 As the instructional technology lead with TLI, Michael coordinates and oversees various academic technologies, integrations, and provides support the staff and faculty of CSUCI, but he still keeps grounded to the roots of what first drew him from the world of design to support. He is always looking to give the individuals he helps their “ah-ha” moments, turning their great ideas and abstract issues into real solutions for faculty and their dedicated students based on the tools and services provided by the campus.